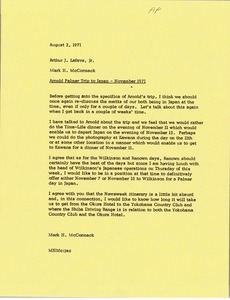 Japan - Discussing Arnold Palmer's trip to Japan. 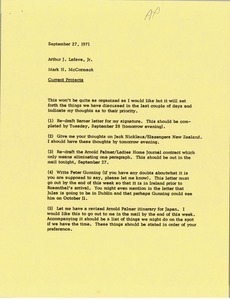 Japan - McCormack lists various items for Lafave to get done as discussed over recent days. 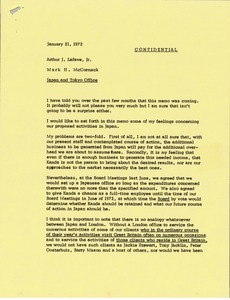 Items include, drafting letters, ideas for Jack Nicklaus and Slazengers New Zealand, an Arnold Palmer and Ladies Home Journal letter, Arnold Palmer itinerary for Japan and other matters. Japan - Concerning the Chunichi Crowns Tournament. 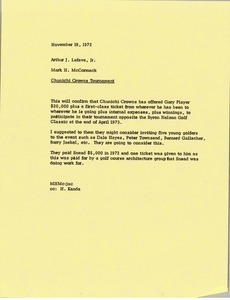 McCormack confirms fees to be given to Gary Player for participating in the event which occurs opposite the Byron Nelson Golf Classic and suggests inviting Dale Hayes, Peter Townsend, Bernard Gallacher, Barry Jaekel, or other young golfers.